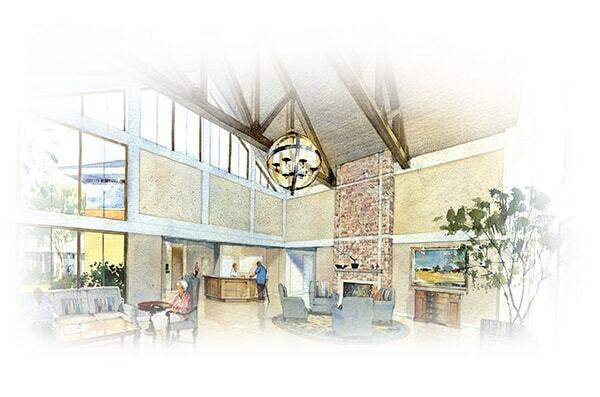 Altenheim Senior Living, the only not-for-profit Life Plan Community in the Strongsville area, is expanding its footprint in the community. 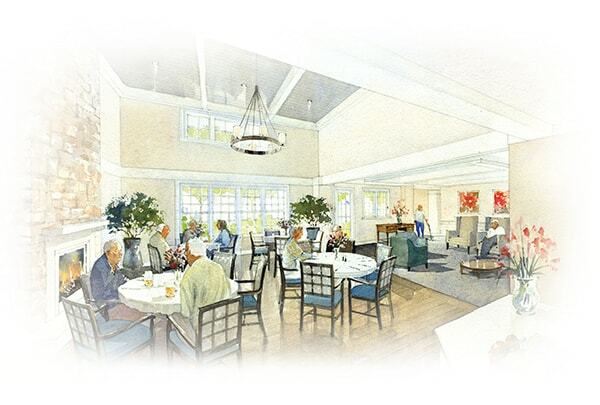 The construction of two new residences will further enhance the Altenheim legacy for compassionate, award-winning, innovative care. In celebration of Altenheim’s 125th year of caring, the Board of Directors has approved a Naming Opportunities Campaign. You are invited to add your name to a superb legacy of caring. Contact Donna Cantlin, Director, Institutional Advancement, 440-238-3361 X171 or dcantlin@altenheim.com for additional information. You can also complete this form. Altenheim and Planetree — creating environments for optimal care. Planetree is a mission based, not-for-profit that partners with healthcare providers globally to facilitate patient-centered care in healing environments. 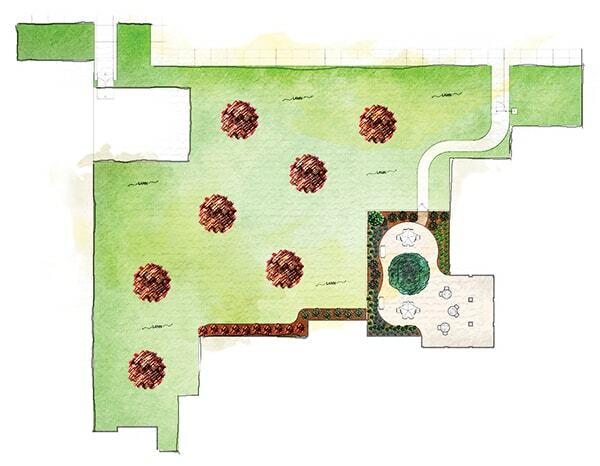 Planetree Principles are incorporated into the designs of both residences by nationally known architects, C.C. Hodgson Architectural Group. These principles represent the highest level of achievement in person-centered care and design which blend design and operational elements in households rather than clinical units. This philosophy aligns with Altenheim’s mission to achieve optimal mental, physical and spiritual well-being of residents, families and the community. Inspired by Altenheim’s Germanic roots, the design is reminiscent of an alpine lodge with iconic elements such as a gabled roof, shake shingles, rustic wood and expansive windows. 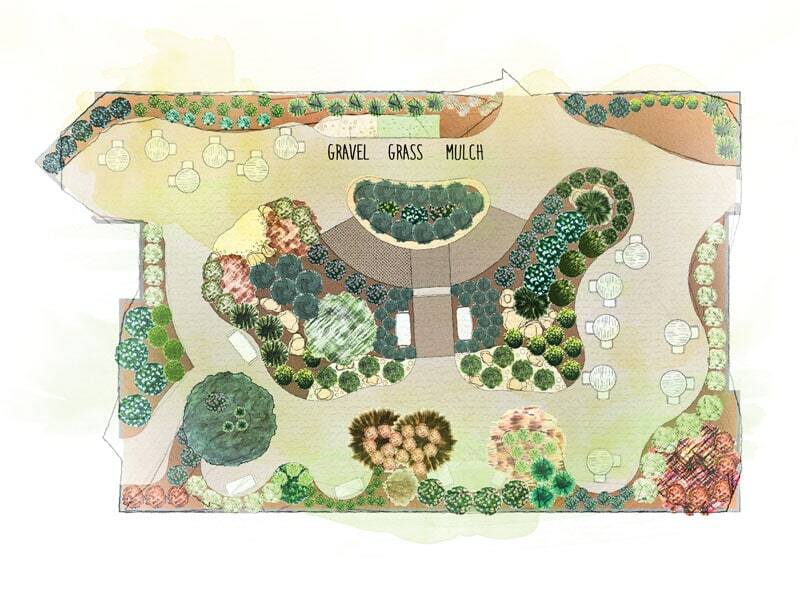 Following progressive hospitality principles, the Therapy Rehab Center includes a Welcome Center, information kiosks, state-of-the-art inpatient and outpatient therapy, and outdoor therapeutic gardens. Thirty-two private resident rooms with private bathrooms feature large accessible roll-in showers. Amenities include room service, a hospitality kitchen, and indoor and outdoor dining areas. Versatile therapy spaces include a fully operational training kitchen, bedroom, bathroom, laundry and an outdoor driveway for training in the resident’s personal vehicle. 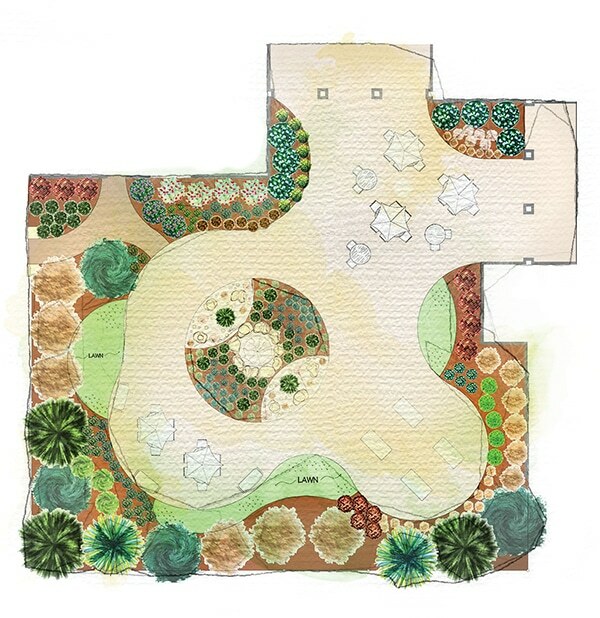 The courtyard encompasses several therapeutic interventions. It replicates the home environment with driveways and ramps for mail retrieval, steps for entering the home and curbs for community access. Uneven walking surfaces such as grass, concrete, and gravel develop safe gait patterns and address balance issues. Activities such as gardening promote optimal functioning and independence. Residents read, visit or just relax while enjoying the flower garden, water feature and the beer garden. 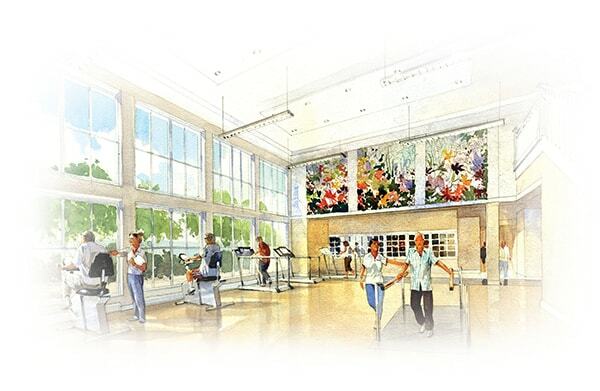 The 4,500 square foot therapy gym has expansive windows with a landscaped view that enhances the therapeutic environment. It includes a Sit 2 Stand Trainer designed to strengthen muscles, and a Biostep 2 for smooth elliptical cross training exercise in comfort and safety. A self-contained state-of-the-art underwater treadmill, the HydroWorx300, utilizes water therapy as a medium to enhance rehabilitation and performance. An inviting fireplace, cozy seating arrangements, and a feeling of hospitality greet residents, families and friends in the alpine lodge setting. The inviting dining room features a stone fireplace and an outdoor dining patio. Expansive windows provide beautiful exterior views and natural light. 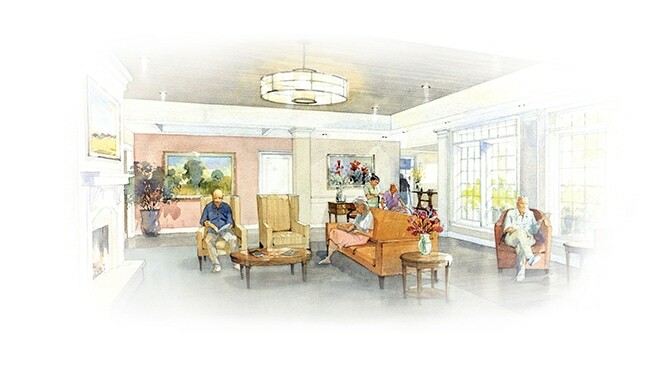 The changing needs of memory care residents are met in this highly therapeutic residential environment. There are 38 private suites, with six households each having its own living room, and enclosed four season room or separate porch and direct access to secured courtyards. 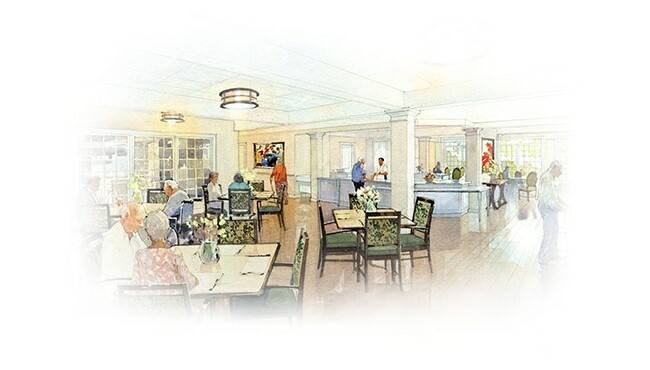 Each floor features a kitchen, multiple dining areas, including a private dining room, activity areas and amenities to support functional abilities and maximum independence. In keeping with the Planetree philosophy, the Hearth Room and adjoining Dining Room have way finding landmarks to assist residents in maneuvering through their environment. Key landmarks include a beautiful stone fireplace, wall paintings and colors that residents associate with these community spaces. This secure courtyard features a soothing water feature with water cascading down coppery tree leaves into river rock. A butterfly garden and shade trees adorn the walking path. There are flower beds for residents’ enjoyment and raised planters for gardening. This cozy, secure courtyard makes for an inviting outdoor space with several trees including a beautiful honey locust shade tree and flower beds. Colorful foliage in the spring, summer and fall enhances the relaxing courtyard. Featured naming opportunities range from $15,000 to $1,000,000. Additional opportunities at various levels are available. Contact Donna Cantlin, Director, Institutional Advancement, 440-238-3361 X171 or dcantlin@altenheim.com.